One of our breakthrough in house products catering to the healthcare industry is out Intelligent Medical Software (IMS). This comprehensive tool is innovative, futuristic and wholesome. It is a one stop solution that connect Physicians, Patients, Labs, Pharmacies and long-term care facilities IMS features include a Scheduler, Healthcare Portal, IVR Services, Authorization / Referral Tracking, Auto Check-In, Check-In / Check-Out, EMR, Prescriptions, Lab Orders & Tracking. It also has an inbuilt Letter Writing, Form Filler, My Tasks, Health Maintenance Reminders, Notes, Alerts & Reminders, Dispensary & Inventory Controls and Reports Preparation & Management to provide single solution for all our healthcare partners. Adept's EMR Advisory team recommending to choose Intelligent Medical Software (IMS) developed by SuiteMed provider of integrated medical software solutions supporting the primary process of healthcare delivery - solutions that connect physicians, patients, Labs, Pharmacies and long term care facilities. One of the most versatile, full-featured, and customizable appointment schedulers on the market. Staff can manage workflow with great efficiency and effectively orchestrate the resources of multiple offices - or just one. Built by physicians and pharmacists, the Healthcare Portal allows patients access to a personal healthcare homepage to view and update most information related to their current health record. It also allows patients to pre-register for doctor visits via a secure Internet interface. Decrease the burden on your staff and increase your revenues by reducing missed appointments! 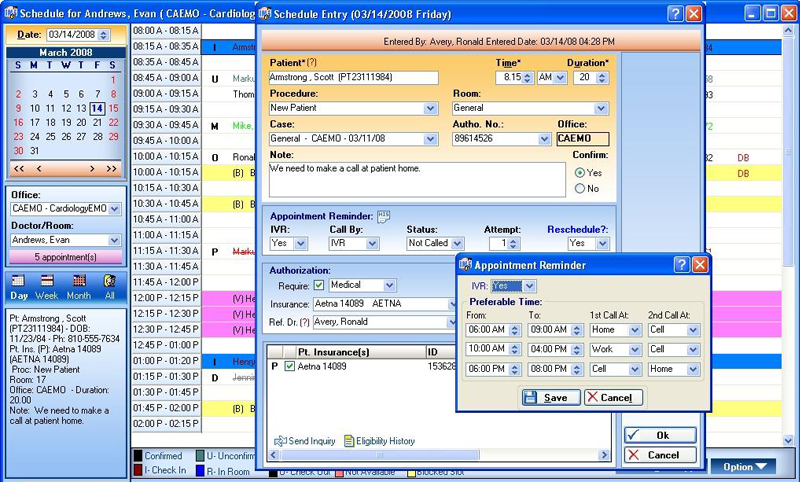 Have the automated reminder system - or a live SuiteMed Receptionist - call your patients to confirm appointments. Billing for a patient encounter is dependant on obtaining proper Authorization and Referral information. IMS Authorization and Referral Tracking ensure that every patient encounter is pre-validated so no encounter goes unbilled. Allow patients to check themselves in when arriving at the office using a secure and private computer interface device. Comprehensive management of patient flow results in improved patient care and office efficiency. The IMS Check-In / Check-Out module delivers patient status and related instruction communication between the physician and the front office staff during patient check-in and check-out. Record a patient's medical encounter as an electronic medical record - it's easy for physicians and won't compromise workflow. Physicians choose the method for record creation- from templates, dictation, transcription, or handwriting. Full integration with IMS modules allows automatic drug interaction, drug dosing, allergy, and diagnosis contraindication checks. The Lab Orders and Tracking module helps your office track the various labs that physicians order during a patient visit. Physicians no longer need to dictate letters for the front office staff after examining a patient. Form Filler - No More Paper Forms! One of the most redundant and inefficient processes in healthcare revolves around one unavoidable facet - forms, forms, forms. Tasks need to be completed long after a patient has left the office. Take control over these critical follow-up tasks, with My Task, a viewing tool that presents outstanding tasks that need to be completed - whether waiting for Lab Results, patient refill request authorizations, or unsigned Visit Notes. The most versatile, user-friendly health maintenance reminder system in the market today, the IMS Maintenance Reminders help clinicians enhance patient care by assuring timely completion of appropriate tests, immunizations, exams, screenings, and education. The Drug Dispensary and Inventory streamlines the process of dispensing drugs and other materials within a clinic. Do you face the challenge of managing in-house drug dispensing? Now you can safely and accurately dispense medications in your practice. SuiteMed Drug Dispensary is integrated with the SuiteMed and Prescription modules for seamless transfer of data. 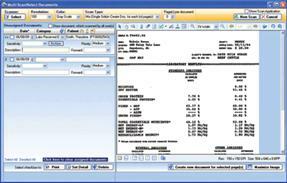 Reports are a cornerstone of practice maintenance, management, overview, and financial status. With IMS Reports you have over 100 report options. Office administrators are empowered with easily generated summaries or detailed overviews of every aspect of the medical office operation. Increase billing accuracy, efficiency and productivity with this HIPAA Compliant and EDI functional billing module. Emulating a biller's normal daily workflow, the Billing module offers electronic billing capabilities, aging, outstanding and summary reports along with easy to read graphs. Easily condense and organize paper flow into a user-friendly, easily-accessible digital document file cabinet. One click takes you to one screen where users can view and retrieve all patient-related information. Register patients with accuracy and speed using fully automated Bar-Coded ID Cards. SuiteMed's Healthcare Portal is one of the most advanced evolutionary steps in healthcare. It allows patients to be more connected to their medical lives — putting more control, more responsibility and more proactive self-diagnosis in their hands.